When traveling abroad, you almost always have to think about the local electricity / the power situation: What is the voltage in Germany? What do the plugs look like? Do I need a power plug adapter and/or a power converter? What travel adapter will work? I know the problem just too well. So on this page I’ll compile some details about the plugs and sockets commonly used in Berlin, Brandenburg and Germany – what power plug voltage to expect so you can decide what plug adapter and power converter you might need to get your devices connected to the local grid. First things first: in Berlin / Germany voltage may differ from your home voltage. In Berlin and Germany and most of the European countries we have a 230V voltage power grid with a frequency of 50Hz. That means, if your electronic devices are built for 110V, you will have to use a power converter – otherwise your devices may get broken. in Germany we have basically two different types of power outlets and power plugs. The first electrical plug I want to introduce to you is the Schuko plug – or Schukostecker in German which is short for “SchutzKontakt” – Safety Contact. It’s the larger, almost round power plug – and it is a grounded plug. It is mostly used for larger, more power consuming devices like TV sets, fridges, washing machines and some semi professional fans. The power cords are slightly thicker and rounder than the power cords of low power devices since they feature a third cable. Most of the power outlets you find across Germany are built for the grounded plugs. The matching plugs and sockets feature two additional metal stripes on the side so devices connected with this combination of plugs and sockets are grounded. The ungrounded plugs you often find on low-power devices, will also fit into these round grounded plugs. 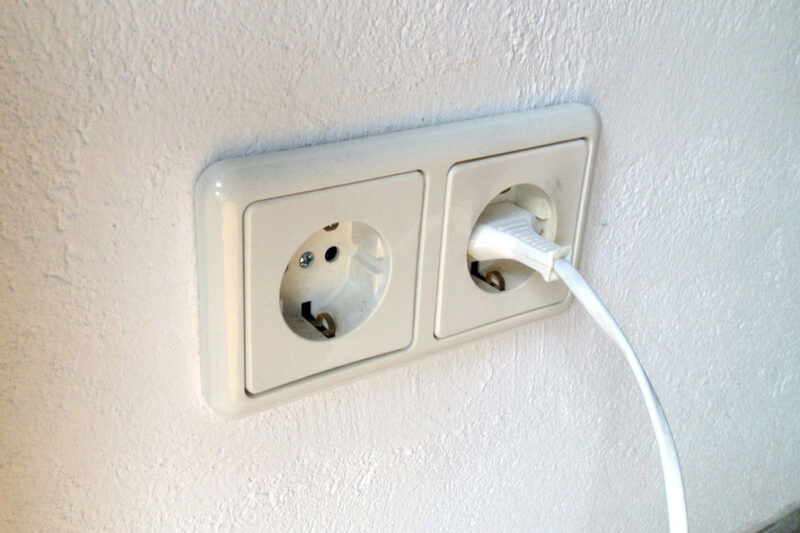 They are often also called “Europlugs” (Eurostecker) since they are common across many European countries. The respective socket can sometimes be found in locations, where the use of high power electric devices should be avoided. This is why you may find yourself in some bathrooms for example without a socket to plug your fan in – or any other device that features a round, grounded plug. In the above picture you can actually see that exact combination: a non-grounded plug Eurostecker is attached to a grounded plug. In the lower part of the round you can recognize the metal stripe that is meant to connect to the grounded metal stripes of the grounded plug. Faster Charging: Qualcomm;reg certified QC3.0 charge port supports rapidly charging 80% battery in 30 minutes, 4 Times faster than normal USB ports. 3 Smart USB Ports (0~2.4A, 6A/30W Total) support for faster charging of larger devices like iPhone,iPad,Samsung,Tablets etc in short time. Free travel case included. 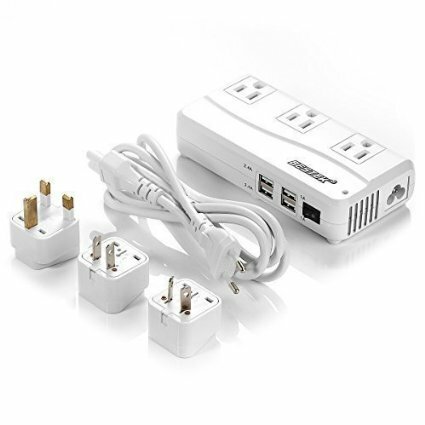 Super compact size(Dimension only 5.8*3.2*1.2 inches) with detachable power cord. Free travel case included for you to carry the converter on the go. More Compatible: International adapters(US/EU/UK/AU Plug) compatible with all outlets in NA,UK,AU,Japan,China, Most of Europe, Asia and more than 150 countries worldwide. 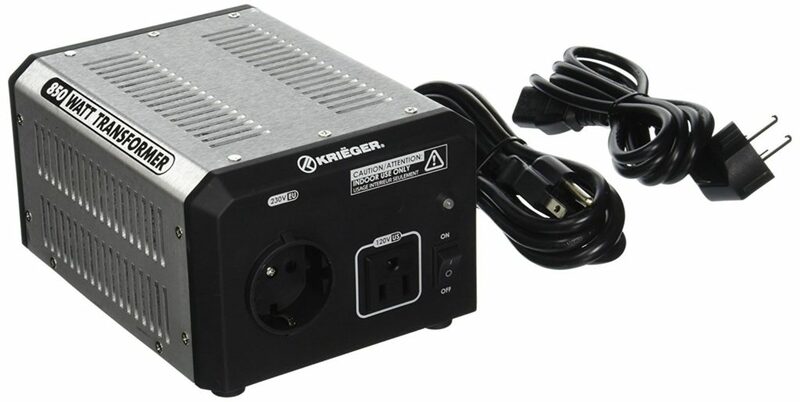 This is quite a power adapter for power users: The 200W Travel Power Converter that converts Berlin / German voltage of 220V to US voltage of 110V, including 4 USB Charging Ports (6A Max) – suitable for more than 150 different counties. 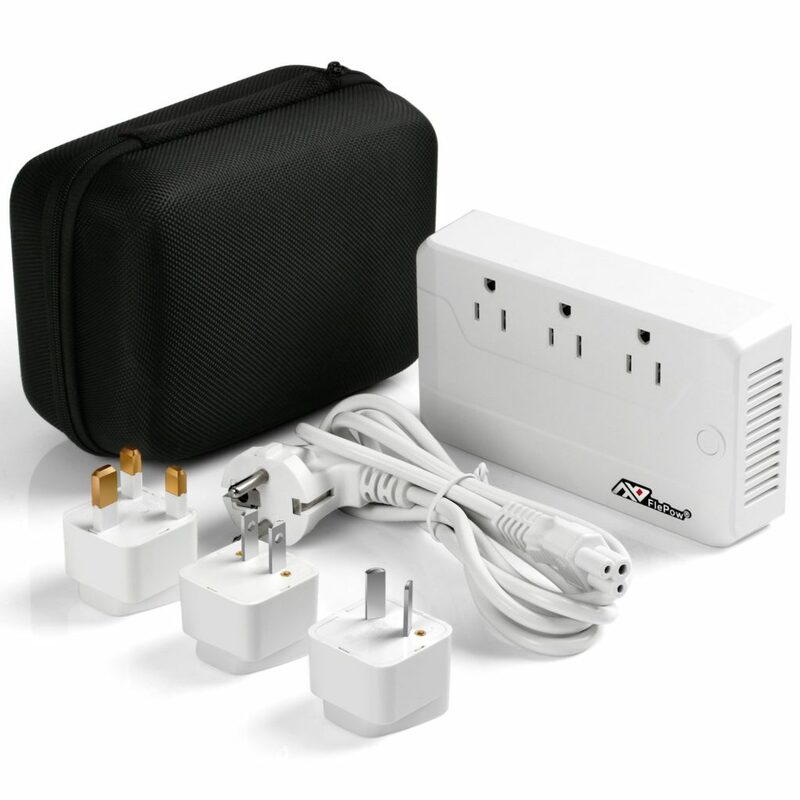 This adapter may be very helpful if you are traveling or moving to Europe, bringing various different electrical devices.